MY ANSWER: I don’t always answer the optional IWSG questions, but this one struck me as extremely relevant. Most artistic people I know have more than one creative outlet. It is as if the creativity bubbles inside them and wouldn’t be consigned to one single stream. As I discovered recently, I’m no different. I’ve always made up stories, since I was a little kid, so it was a logical progression for me to start writing down my stories. But I haven’t ever considered myself an artist, couldn’t draw a straight line to save my life. Surprisingly, few years ago, I started designing book covers from the existing free images available on the internet, and I found it such a satisfying activity, I can’t stop. Most of my pre-made book covers are in the genres of science fiction and fantasy. Each one is almost a visual story in itself, with a protagonist and her complex milieu. Sometimes it is a witch with her pixie helpers. Sometimes it is a princess who befriended a dragon. I use people 3D rendering made by other artists in DAZ studio or Poser and backgrounds offered by wonderful photographers and artists on Pixabay and other similar free websites. My pre-made book covers are like an assembly line, with 2 to 20 different elements in every cover. The sample cover below includes 9 elements. You can see all my pre-made book covers on my DeviantArt page, and I often add new ones. I would be very happy if someone liked my covers and used one of them for their book. The book covers I made for wattpad, for all my stories and for other writers’ stories as well, are a bit different. For them, I used predominantly photographs as the basic images, not DAZ renders. You could see the examples on my wattpad page. It is not my favorite approach; too many cover artists use realistic photographs these days, and the images seem to blend into each other, with nothing to distinguish one author from the next, on Amazon or any other book retail site. At least, my DAZ and Poser based covers are unique. I also make badges for the WEP challenges, have been making them since 2016. It started with a casual request from Denise Covey, the WEP founder, and it is very different from my book covers endeavor. With the book covers, I make them mostly for myself, to satisfy my artistic itch. With the badges, it starts with a theme. After I find an appropriate image for the theme, I design a badge and ask the other WEP team members for their feedback. Sometimes, my first attempt is approved right away; everyone likes it. Other times, I don’t get so lucky. I might go through a half-dozen or more different images for one challenge, before it is accepted by all the hosts of WEP. We swap ideas and discuss possibilities. I found it especially hard with challenges leaning towards abstract concepts, but so far, I’ve always come out the winner with a final badge everyone likes. And it’s such a giddy feeling, when I finally get an ‘okay’ for a badge from everyone, I always feel like celebrating. Perversely, until I do get an ‘okay’, I feel like I’m an imposter, a failure. Like I’d never get another badge right in my life. Like many artistic personalities, I’m very sensitive to my friends’ critique, and each time they dislike my first draft, I would sulk and think something along the lines of “oh, they don’t understand…” But then, I would search again, listen to their suggestions, find a better image or a better composition, and the final badge is always, without exceptions, the best of all my attempts. Obviously, my friends do understand. One of the examples of my hard-won badges is the one for the upcoming WEP challenge in February, 28 DAYS. I went through several different images before I found this one, the one everyone approved. The process wasn’t easy, but the result was all the more satisfying because of it. Come and join us in this challenge. 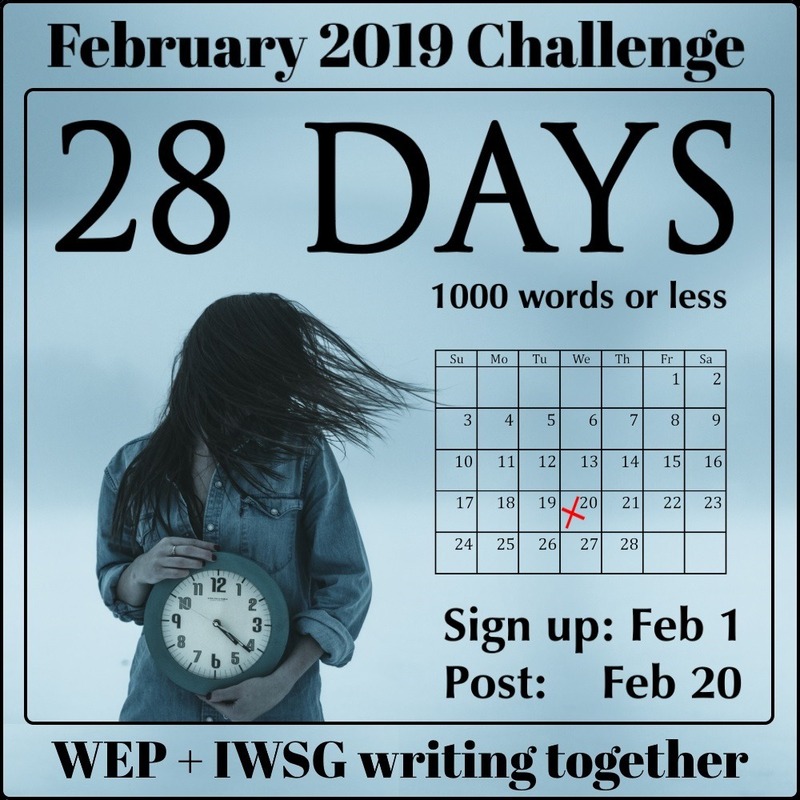 What could you write about 28 days? What other creative outlets do you have, in addition to writing? Tell me in the comments. 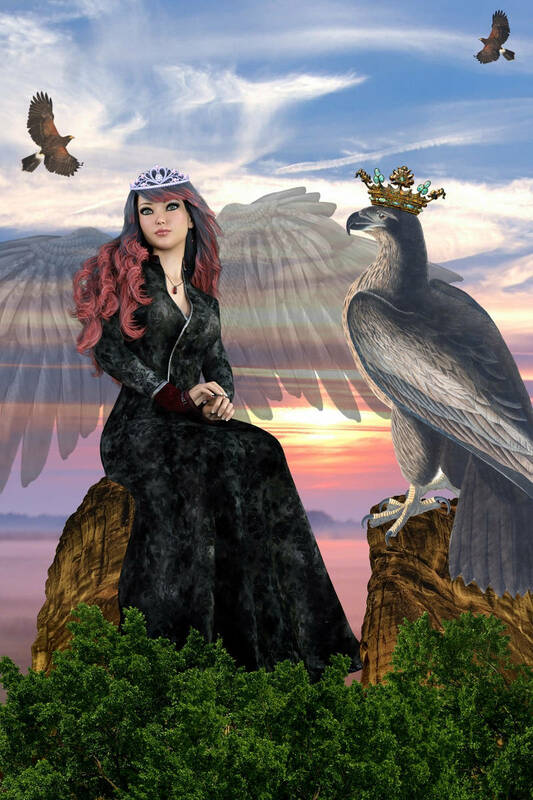 This entry was posted in art, book cover, Insecure Writer's Support Group, Olga Godim, WEP and tagged art, book cover, deviantArt, Insecure Writer's Support Group, IWSG, Olga Godim, wattpad, WEP. Bookmark the permalink. I really like your WEP badges. They capture the essence of each challenge. Wow! Now that’s the best additional creative outlet for a writer. Fantastic. Will file away your details for when book cover time comes round. I’m just getting started with online graphics creation, and I’m looking forward to learning BookBrush to create promo graphics for my books. I do enjoy seeing your creative covers. I wish you happy writing and image composing in February. You are definitely creative. I don’t think they allow you on DeviantArt unless you are. And badges–I’ve strugged with those, failed, turned to Canva, and still failed. Nice job! You’ve done great with the badges – really liked the joint one you made for the WEP-IWSG partnering. I’ve admired your WEP badges, Olga. They are absolutely perfect for each theme. I didn’t know you did cover design. How wonderful. Woot for delving into the creative ventures! I’ve faced many of those “oh, they don’t get it…” moments with my artwork. It’s tough, but good opportunities for growth! That’s great that you can make covers and badges. I’m not that creative. It’s a great talent to have and goes well with your writing. I enjoy searching around for graphics to mashup, and manipulating my doodles to use on my website and, yes, I did create the KNOW ME cover in Photoshop. I can’t imagine creating graphics for other writers. Would definitely feel pressured! Congrats for that! I’ve actually noticed a lot of people today say that they don’t have another creative outlet outside of writing, that writing is their only creative outlet. I really like your badges! I’ll also check out your book covers. Graphic design takes as much talent as traditional art. Your badges are great! I wish I had that type of artistic ability. I’d love to do my own covers. Enjoy your talent. Olga, I know the elimination game for the WEP badges must be painful for you at times, but it works when we all have input and it pushes your creativity to the next level. You’ve had validation in some of the comments today and i add mine. It’s taken a load off me and your badges are so superior to mine. I thrashed around after picmonkey began charging and still haven’t found a photo editor i like. I’m creative on many fronts, not only writing. I think travel can be seen as creative as I use the different settings, cultures and people in my stories. Fun research. Vietnam has been wonderful. I love doing book covers. Your book covers are very imaginative and beautiful. It’s so great to have a creative outlet that works hand in hand with the writing craft. And I must say, the badges you’ve done for WEP are lovely. Hoping to add one to my site this year. I like that one you featured 😀 … have you thought of getting your covers on a site like SelfPubBookCovers.com? Your badges and covers are beautiful. I love that your covers are not just silhouettes and skylines. Keep it up! I think “Time Travel Blue” and “Crystal and Wand” are really neat. (I don’t have stories to match them, but I think they’re beautiful.) “Sword in the Mountains” reminds me of my dad, but with lighter hair and a sword instead of a bow and armor instead of deer. But still. Several also remind me of SecondLife, which I use to play. Love the February badge! Congrats! That sounds like fun–working with different images to create a cover or badge. I did my own cover for a short story collection and it was a lot of work, but I learned a lot of editing skills. Not the most amazing cover ever, but it suited my needs at the time.